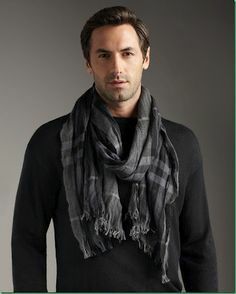 There’s that hint of classy swagger that comes with a scarf when men wears it. 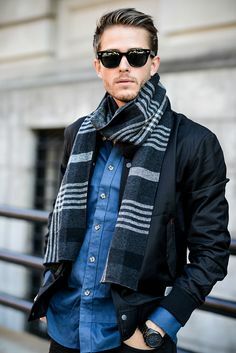 A scarf can be one of the best accessories for men out there. Unfortunately, it’s a stylish piece that is a bit tricky to wear. 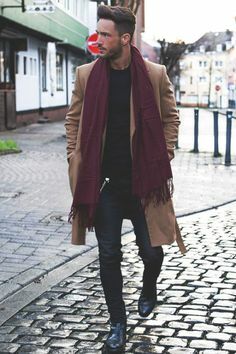 You’re certainly going to wear a lot of scarves for fall and winter together with awesome fall outfit ideas as well as experimenting on layers. 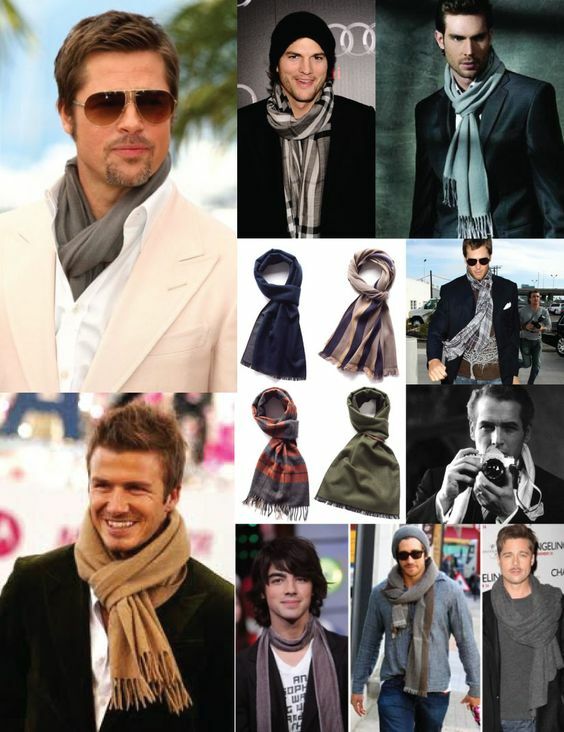 Below are masculine ways to wear a scarf. 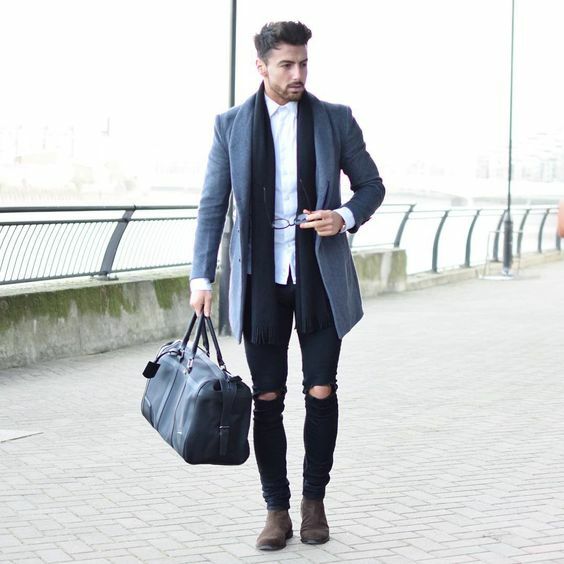 This combination is the perfect bridge between smart and casual. Swap your tie for a scarf to achieve an easy-going look. 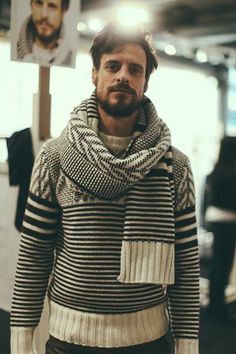 When a chunky sweater isn’t enough to keep you warm on the cold days, add a scarf to keep your neck warm. 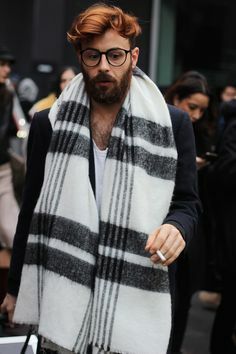 It’s always best to invest in a scarf which you can wear so many times and in so many occasions. 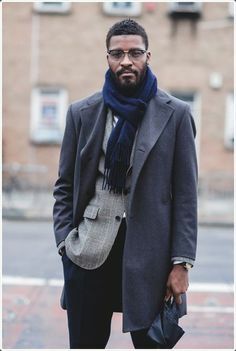 Pick a scarf that you can wear with jeans and a shirt and your suit too. 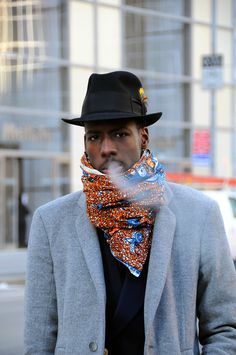 If you think your outfit is too plain, add a bold and printed scarf to your look. It will instantly update your whole outfit. There’s plenty of ways to get creative with your scarf, depending on the length of it. Play with it without making you look so bulky. Wind mishaps won’t happen if you tie your scarf this way. 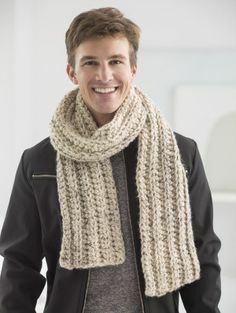 Known as the “too cool to care” look, wrap around your neck making sure to leave one side longer than the other. Look sophisticated and regal in a navy blue trench coat and a hat with a printed scarf. 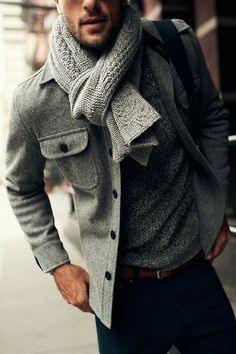 Balance your entire look by wearing a thin sweater then adding a chunky sweater to your outfit. It’s an effortless way to create a stylish ensemble. Create a savvy look by pairing your chambray button down with one of the blazers you wear for work. 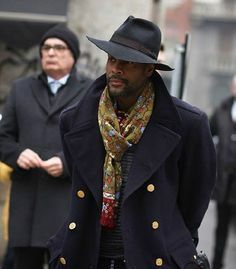 Add a scarf for an added style. You don’t really need a step-by-step guide when it comes to wearing your scarf like this. 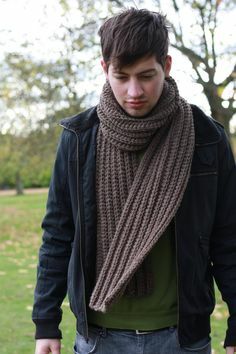 You just hang the scarf around your neck. It doesn’t get any easier than this. 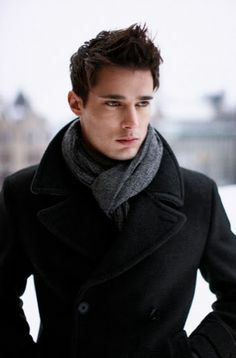 Scarves do an excellent job of making a man look stylish while keeping the neck warm. 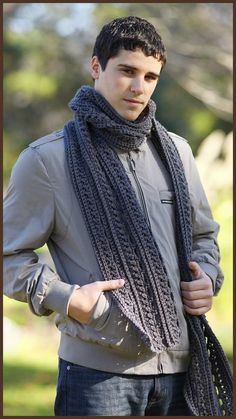 A thick scarf can keep you warm on a cool morning and even a thin scarf can protect you from the sun. A very casual outfit that you could wear, perfect for every day. 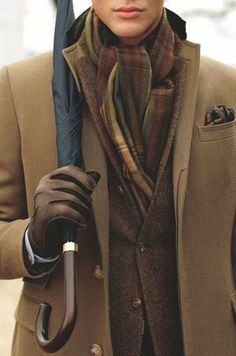 There’s always that sophisticated and classy vibe when your suit and scarf matches perfectly. You can never go wrong with an all-black everything. This will make you look more dapper than ever. If you’re not into uniform pieces, you can always add another color to the look. 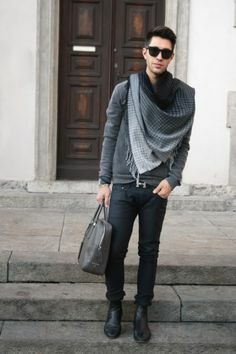 Mix gray with your black top to create a simple, trendy look. A timelessly slick knot that will surely become one of your go-to. 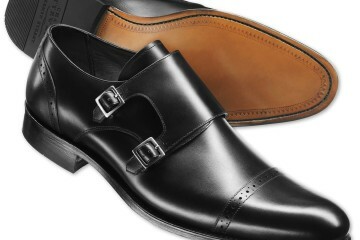 It will make your outfit look so sharp. Mix the right textures without looking too bulky. Experiment on the many basic pieces you have inside your closet. 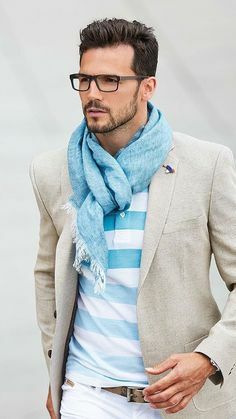 A scarf can add a strong element of style especially when you add it to a bland outfit just as long as it doesn’t compromise functionality. A beige chunky scarf is an important must-have in your closet. 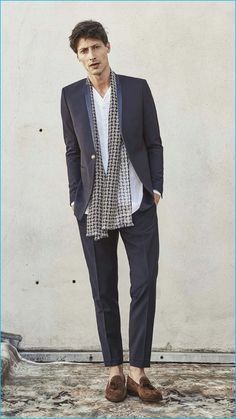 Combine formal pieces and casual pieces to create a unique ensemble. 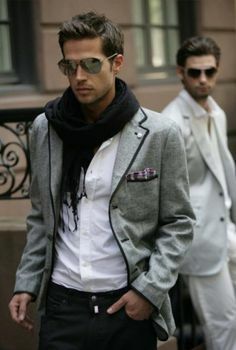 Don’t be afraid of sporting light-colored scarves as well. 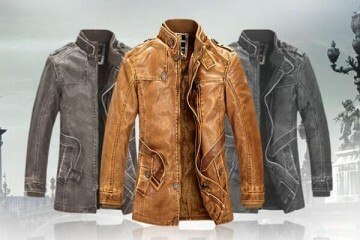 They will look nice on spring and summer. When you’re wearing pieces in basic colors, add a touch of flare to your ensemble with a burgundy scarf. 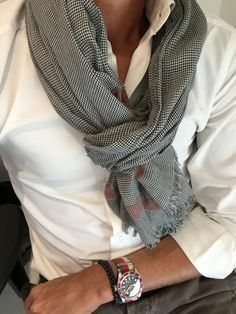 Sometimes, keeping the outfit simple is a good rule to keep in mind so it won’t be competing with the scarf’s attention. Determining the right scarf for you – for who it’s designed for – is pretty easy. Obviously, an animal print, magenta or floral scarf aren’t for men. 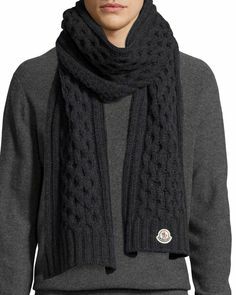 One thing you shouldn’t forget about tying your scarf is to tie them in ways you’re comfortable wearing. Confidence is key. 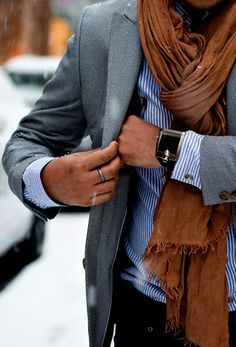 A scarf can easily complete your office outfits. Add a contrasting-colored scarf to your neutral outfit. 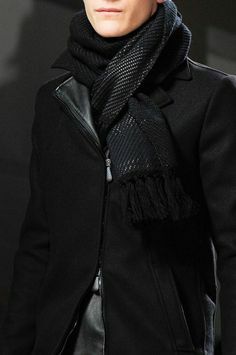 You’ll still look tough even if you add a scarf with your leather jacket. 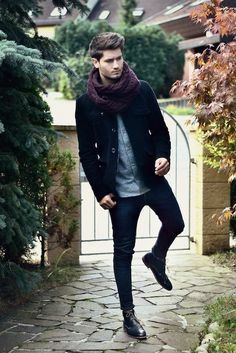 So many men are sporting this kind of getup these days. With pieces you already have in your wardrobe, you can create a stylish ensemble. 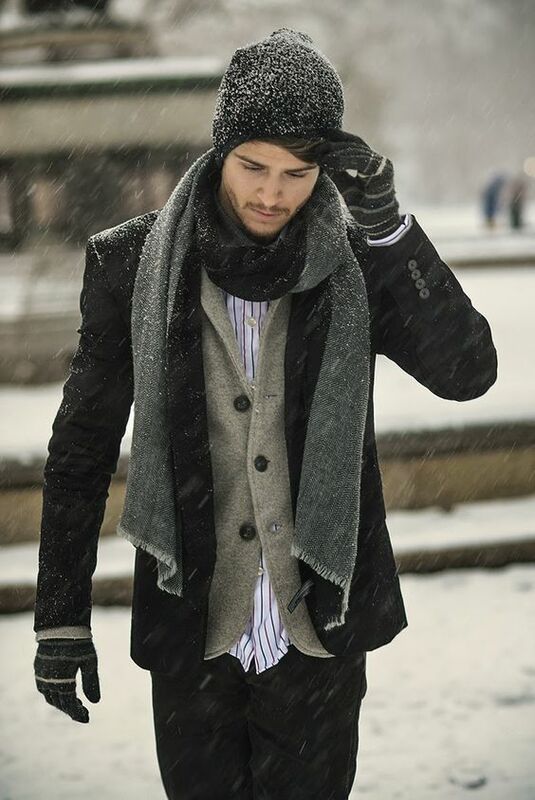 To create a dapper look for snow days, always try to switch up your outerwear and layer, layer, layer. Consider the function first before anything. Second comes fashion. You limit your tying options when it comes to the scarf’s thickness and length. 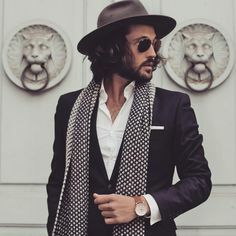 A scarf isn’t a necktie so you better keep it loose.